The aim of Khronos Group’s Vulkan Portability Initiative is a universal subset of Vulkan 1.0 that is designed to run at native performance levels over Metal and DirectX 12 drivers. Metal and DirectX 12 are able to support almost all of Vulkan, with the exception of elements like triangle fans, separate stencil reference masks, Vulkan Event functionality, and a few other features. 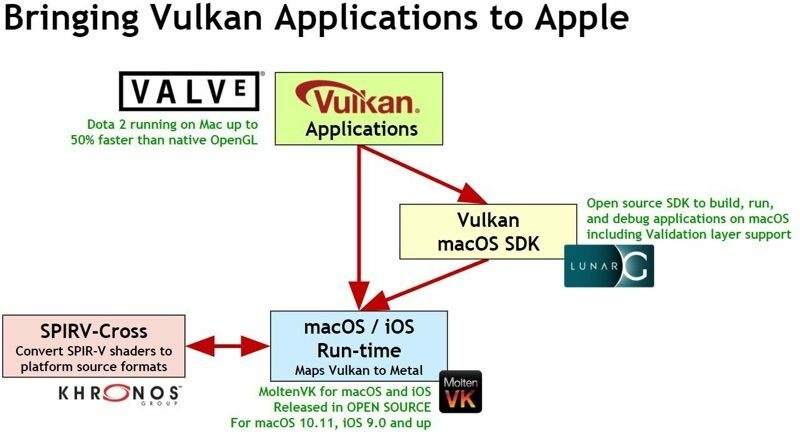 "Running Vulkan applications on Apple platforms has been the number one request from developers and today’s release of the MoltenVK runtime and LunarG macOS SDK brings that capability to life,” said Neil Trevett, VP NVIDIA and Khronos Group President. “Developers are invited to download the open source Vulkan Portability tools today and provide feedback via Vulkan Ecosystem GitHub Issue. The Vulkan Portability Initiative will continue to strengthen the infrastructure and tooling around bringing Vulkan capabilities to multiple Metal and DX12 platforms - our long-term goal is to enable portable Vulkan code to be executed on any platform that developers care about." I don’t believe that MoltenVK will be immediately useful to most serious Mac games developers. Aspyr, Feral, Unity and here at Epic we already have direct, native Metal backends that are (or at least should be) faster and support a greater range of features than another intermediate translation library. Principally anything that requires geometry shaders or tessellation shaders is currently not going to work as MoltenVK doesn’t support them. They are *optional* features in Vulkan so it can still call itself conformant by contrast for D3D these are *required* features in D3D11 onward so games do use them, sometimes extensively. Moreover the approach MoltenVK takes to recompiling shaders makes it infeasible to impossible for them to be supported without significant work and performance penalties. Metal doesn’t have direct equivalents so the MoltenVK library would need to defer SPIRV to Metal translation until said shaders are used together in a Shader Pipeline at runtime. Only then could it recompile them to Metal and emulate all the necessary behaviour but this would result in a big performance hit on the CPU. It would also be harder to adopt the native features offered by Mac Metal to deal with these cases and hurt GPU performance. The other gotcha will be emulating type conversion of data between the resources and the shader. Metal doesn’t have a performant way to do that in all cases right now, so you need to use multiple different techniques to achieve the result while minimising the performance penalty. MoltenVK appears to support only a trivial subset of D3D’s implicit resource type casts which wouldn’t be enough for UE4. I wish them well in their efforts but this is not going to magically result in better performance in games shipped by Feral, or Epic, etc. It might well end up making it easier for smalller studios with their own engines, esp. mobile focused developers, and that is no bad thing. Why? What would be the issue there? Lacking hardware support on iOS devices? Mobile GPUs are architecturally *very* different from desktop GPUs so don't have the same features. 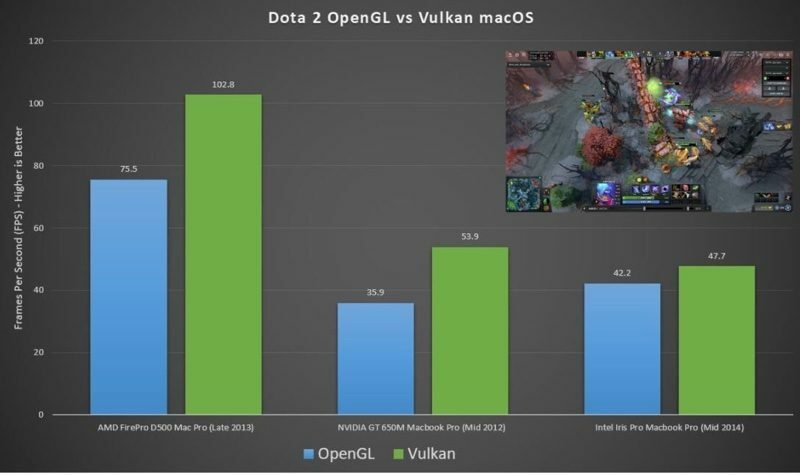 Metal's API design was predominantly driven by the needs & capabilities of iOS GPUs, hence why geometry shaders are absent and why the tessellation pipeline is completely different to D3D. Obviously the macOS hardware could support these features in a way that is directly equivalent to D3D and were Apple to do that and developers elected to use said features then those titles would need more work to run on iOS. That being said, it already takes *substantial* effort to rework a macOS title to fit on iOS, as shown by Aspyr's heroic efforts with Civ VI and Feral's equally impressive Rome & GRID ports. Given the difference in performance profile of iOS vs. macOS devices it probably wouldn't really matter as any game that used these features would likely not be viable anyway. I wish everyone would just stop using DirectX and Metal and just use Vulkan. That way, there's only one 3D library and in the future, porting games to different platforms is a lot easier. Realistically, since so many games now are made in an engine such as Unity or Unreal, porting games has already been mostly trivial a lot of the time. It's not as common these days to have to actually port a game from scratch where you worry about the details of Vulkan, Metal, etc. Now you have to worry about developers signing up to be published by Microsoft, who then prohibits the game from appearing on non-Microsoft platforms even though there are no technical issues preventing it. Maybe I'm wrong here, but my understanding is that you do not have to translate the SPIRV shaders to MSL at runtime. MoltenVK apparently comes with a separate conversion tool ('https://www.moltengl.com/docs/readme/moltenvk-readme-user-guide.html') that's supposed to allow you to do this beforehand, and then you can pass your MSL shaders directly to your Vulkan code. It's surely an extra step during the porting process, but you wouldn't have to deal with the performance hit. That’s what I said sir, by doing this offline for SPIRV you avoid the runtime performance hit BUT you CANNOT use some/all Metal specific feature and you CANNOT emulate geometry or tessellation shaders. Emulating them requires the full set of shaders in a pipeline so that you can rewrite them to use Metal’s similar but not equivalent features. That is known only at runtime in most engines - not all though. That means combining vertex + (hull and/or geometry) shader stages into compute shaders that must run in an earlier compute command buffer, separate to the later draw call that uses the (domain + pixel shader). Plus all the associated buffer allocations and resource binding shenanigans- it’s actually bloody hard work to get right! Quite a bit off-topic, but do you know what's going on with the major pauses/lag in between seemingly good frame rates in the MacOS version of Fortnite? Looks like it is either texture streaming or shader compilation or a combination of the two. I’ve explained the challenges of dealing with the initial shader setup at runtime, even with precompiled shaders, elsewhere. It still isn’t a solved problem in UE4 or Fortnite and it likely never will be perfect. This isn’t the forum to report problems - that should be done over at the Fortnite forums and the feedback mechanism ('https://www.epicgames.com/fortnite/forums/bugs-issues/bug-reports').